If you want to provide a public Project Opportunity, one where anyone can access a link to join, then Open Opportunities may be of interest to you. Open Opportunities leverage a Dedicated URL Source to guide interested users to join your validation community. Shown on your unique RSS Feed at https://yoururl/Open and on your Community Homepage, Open Opportunities are perfect for public recruitment efforts and generating a robust customer community. Open Opportunities are enabled for your Community or Project through Onboarding by utilizing an Opportunity with a Dedicated URL Source. You'll need both ready to go in order to provide an Open Opportunity for the public to join. Within the Opportunity, configure the Opportunity Summary field to provide a brief description of what they're joining and why they should be interested. Within the Dedicated URL Source's options, check on Open Opportunity checkbox near the bottom of the page. Once both settings are configured, you're set to start recruiting from the public and sharing your /Open page anywhere on the web. 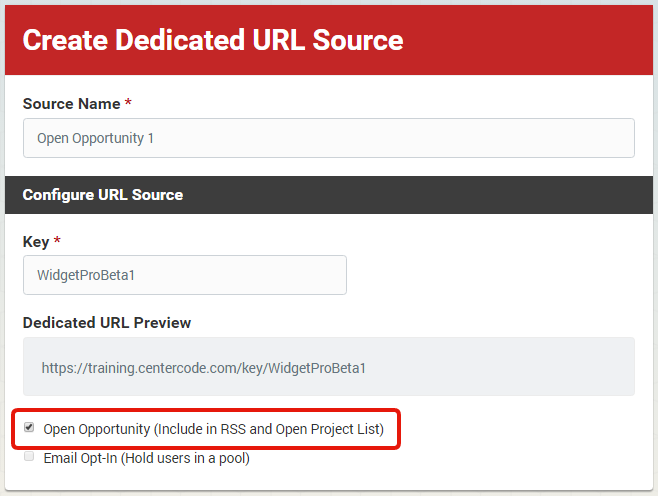 The RSS Feed also gives your users the option to subscribe to your Open list, allowing them to follow and be notified of your Opportunities in an active Community. If you’ve created a Project-level Open Opportunity, it will also appear on your Community homepage for any existing member. The RSS Feed is open to the public meaning anyone that can navigate to this page, whether they’re already a member of your portal or not, to apply. Only one Open Opportunity per Project will be displayed on the Community homepage. If you have multiple Open Opportunities in a single Project, the highest on the Project's list of Opportunities will show.